This airticle is aboot kintra in Sooth Americae. For ither uisses, see Colombie (disambiguation). 68 ethnic leids an dialects. Inglis is an aa offeecial in the airchipelago o San Andrés, Providencia an Santa Catalina. 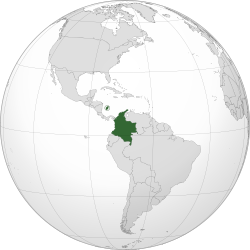 Awtho the Colombian Constitution specifees Spaingie (Castellano) as the offeecial leid in aw Colombie territory, ither leids spoken in the kintra bi ethnic groups – approximately 68 leids – ilk is an aa offeecial in its awn territory. Inglis is an aa offeecial in the airchipelago o San Andrés, Providencia an Santa Catalina. The offeecial Colombie time is controlled an coordinatit bi the Naitional Institute o Metrology. Colombie (IPA: /kəˈlʌmbɪ/), offeecially the Republic o Colombie (Spaingie: República de Colombia, Spaingie pronunceeation: [reˈpuβlika ðe koˈlombja]), is a kintra in north-wastren Sooth Americae. Colombie marches tae the east wi Venezuela an Brazil; tae the sooth wi Ecuador an Peru; tae the north wi the Caribbean Sea; tae the north wast wi Panama; an tae the wast wi the Paceefic Ocean. Colombie an aa shares maritime marches wi Jamaica, Haiti, the Dominican Republic, Honduras, Nicaragua an Costa Rica. Colombie is the 26t lairgest naition in the warld an the fowert lairgest in Sooth Americae (efter Brazil, Argentinae, an Peru), wi an aurie mair nor twa times that o Fraunce. It an aa haes the 29t lairgest population in the warld an the secont lairgest in Sooth Americae, efter Brazil. Colombie haes the thrid lairgest Spainyie-spaking population in the warld efter Mexico an Spain. ↑ "visibilización estadística de los grupos étnicos" (PDF). Censo General 2005. Departamento Administrativo Nacional de Estadistica (DANE). Retrieved 15 June 2013. ↑ Bushnell, David; Hudson, Rex A. (2010). The Society and Its Environment; Colombia: a country study (PDF). Federal Research Division, Library of Congress, Washington D.C. pp. 87, 92. ↑ 3.0 3.1 "Animated clock". Departamento Administrativo Nacional de Estadística (DANE). Retrieved 15 January 2018. ↑ 4.0 4.1 4.2 4.3 "World Economic Outlook Database: Colombia". International Monetary Fund. October 2017. Retrieved 15 January 2018. ↑ "socio-economic policies" (PDF). dane.gov.co. Retrieved 24 March 2017. ↑ "2016 Human Development Report" (PDF). United Nations Development Programme. 2016. Retrieved 29 March 2017. Wikimedia Commons haes media relatit tae Colombia. This page wis last eeditit on 24 August 2018, at 16:38.